I never watched the television show, The Lone Ranger. I heard about it growing up a few times, but for the most part I didn't start hearing about until this new version of it came out. Boy were people mad. I guess it was really the fans of the original show. So when I say that it was a pretty good movie, just know that I'm coming in with my own view on how this particular movie was written and how these particular actors played these characters. I'm not looking at it judging it by the show it was inspired by. I thought the story line itself was pretty well written. It didn't feel as though the movie was taking forever, it went by pretty smoothly. I thought the character Tonto was freaking hilarious and at times he did remind me of a previous character Johnny Depp played, Captain Jack Sparrow, in Pirates of the Caribbean, but I kind of liked that Tonto was pretty crazy and out there. He brought a bit of comedy in the movie, which was good to have. We also learn a bit about Tonto and how he is separated from his clan. I must admit, I liked the character Tonto a bit more than The Lone Ranger. I also loved all the action packed stunts and special effects they had in the movie. They went along great with the story and I didn't feel that they over played on any of the action scenes. This was a really good action adventure with a bit of comedy movie that I enjoyed. Disclosure: All opinions are my own. 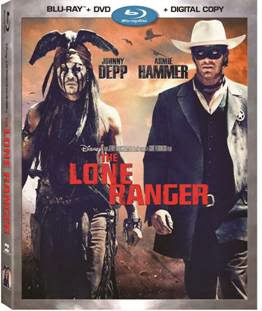 I received The Lone Ranger on blu-ray/DVD at no cost for the purpose of this review. No other compensation was received.